M T D F e b r u a r y 2 0 1 9 38 M o u n t i n g / B a l a n c i n g less eccentricity). As a result, the wheels today are primarily balanced to correct static force. Wheel balancers place two weights to perform a dynamic balance, but actually a single weight can now suffice to provide the same dynamic balance if it is placed in the exact correct location; all because the wheels are better quality. is can be proven. When balancing you'll notice that the two correction weights are oen located in the same quadrants of the wheel. Shiing over to a static mode you can see that most of the imbalance is also reflected in the static mode. e fact is that most wheel balancers are outdated and need to catch up with the better-quality wheels we are now balancing. Newer wheel balancers are able to scan the wheel and allow the operator to place a single weight over 70% of the time in a single computer-chosen position to perfectly dynamic balance the wheel. is can save over 33% in labor costs on every wheel that is balanced. at's enough labor savings in an average tire shop to make the lease payment on that new machine every month. Hennessy, Vanderheyden: Improper mounting results in 60% of vibration-related comebacks. Excessive residual static results in 10% of vibration-related comebacks. Improper wheel weight usage results in 7% of vibration-related comebacks. Modern tire changers and balancers are designed to accommodate the challenges of modern tire and wheel assemblies with adjustable pin plates, balancing algorithms and laser-guided wheel weight placement capabilities. e latest tire changers, such as the Coats 80X Rim Clamp tire changer, speed bay turns, which leads to increased profits for shops. Coats offers an online video series that explains the tools and technologies to increase tire changing speed and efficien- cies. e Coats buyer's guide steps a dealer through the process of selecting mounting and balancing equipment. Hunter, Liebetreu: Low-profile and run- flat tires challenge the ease of use and effort of traditional equipment. us new equipment offers aids and power tools like leverless, etc. The larger assemblies are physically hard to manage, thus wheel lis, etc. New assemblies demand accuracy as well. ey can be sensitive to vibration and damage during service. New vehicle suspensions are more highly tuned, driving the demand for perfection in service even higher. e best equipment and best equipped shops are better able to handle these addi- tional requirements with easy mounting, damage-free tire changers and accurate, weight efficient, and road force capable balancers. 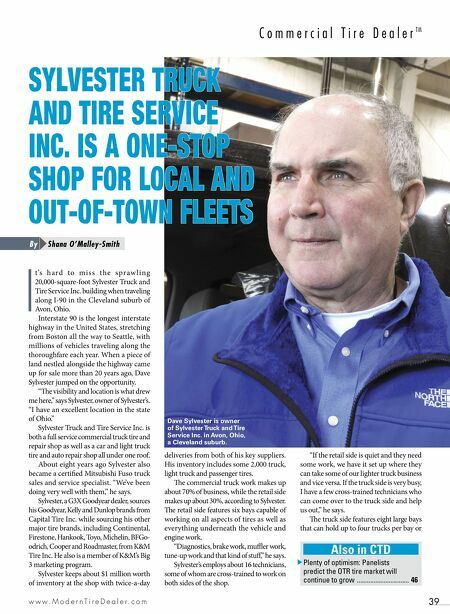 e successful tire dealers can separate themselves from what is perceived as a commodity market. ose who are able to set themselves apart as vibration experts and tire specialists will be more successful than those who do not. Having the right equipment and trained personnel is critical, but expressing this to customers is equally important. Snap-on Equipment, Harris: Customers can leverage the SUV trend by stocking larger sizes for trucks and SUVs and by being sure their equipment is up-to-date and well maintained to handle these larger, heavier assemblies. 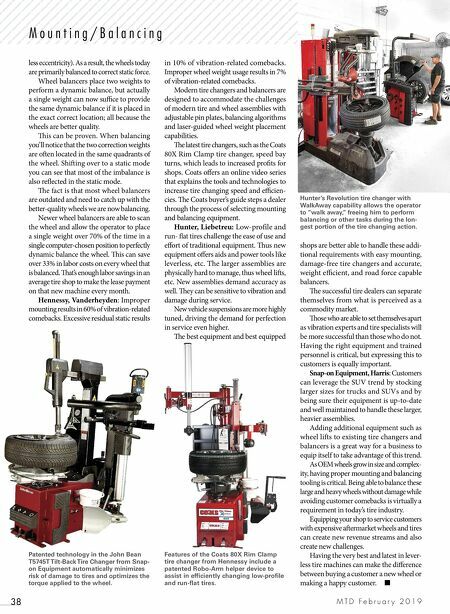 Adding additional equipment such as wheel lifts to existing tire changers and balancers is a great way for a business to equip itself to take advantage of this trend. As OEM wheels grow in size and complex- ity, having proper mounting and balancing tooling is critical. Being able to balance these large and heavy wheels without damage while avoiding customer comebacks is virtually a requirement in today's tire industry. Equipping your shop to service customers with expensive aermarket wheels and tires can create new revenue streams and also create new challenges. Having the very best and latest in lever- less tire machines can make the difference between buying a customer a new wheel or making a happy customer. ■ Hunter's Revolution tire changer with WalkAway capability allows the operator to "walk away," freeing him to perform balancing or other tasks during the lon- gest portion of the tire changing action. Features of the Coats 80X Rim Clamp tire changer from Hennessy include a patented Robo-Arm helper device to assist in efficiently changing low-profile and run-flat tires. Patented technology in the John Bean T5745T Tilt-Back Tire Changer from Snap- on Equipment automatically minimizes risk of damage to tires and optimizes the torque applied to the wheel.